Posted 7/1/2011 2:29pm by Cheryl Ferguson. Our raspberries have decided to take their summer vacation and won't be back 'til August. That also means that our Pick-Your-Own is closed until later in the summer as well. :-( Sorry to disappoint! However, our yummy organic blackberries are available at Cobblestone Farmers Market, King Farmers' Market at the YMCA and the Reynolda Village Farmers Market. On-farm sales are welcome too -- please call first to make sure we have what you want picked. Check our website for updates on PYO! Pick Your Own Raspberries Saturday at Plum Granny Farm! Posted 6/23/2011 5:01pm by Cheryl Ferguson. We had a terrific inauguration of the Plum Granny Farm Pick-Your-Own raspberry field last weekend! Thanks so much to the nearly 50 people who came out! This weekend we will be open for picking on SATURDAY ONLY (6/25). Picking hours are 8:00 a.m. until 1:00 p.m. The weather forecast calls for a beautiful day. Raspberries are $5 per pound. We provide picking containers but please feel free to bring your own container to take your treasures home. The spring berries are less prolific than the fall ones so it is a little more difficult to pick now than it will be in August – but there is a lot of fruit out there! In addition to pick your own, we will have pre-picked blackberries, freshly harvested garlic and beautiful oriental lilies. Thanks for your interest and we hope to see you on Saturday! Pick Your Own Raspberries Now at Plum Granny Farm! Posted 6/15/2011 7:56pm by Cheryl Ferguson. After many requests from our raspberry-loving customers, we have decided to open up our field for PYO raspberries! Red raspberries (Caroline and Heritage) will be available depending on weather and growing conditions. Please call (336-994-2517) or check our website (www.plumgrannyfarm.com) to make sure berries are available before you come. Feel free to bring a picnic, sit under the apple trees and enjoy the view! We're just 9 miles south of Hanging Rock State Park so you can make a wonderful day trip out of it! Where: 1041 Flat Shoals Road – Take US Hwy 52 North of Winston-Salem, Exit 122 RJR - Moore Rd. Turn left and drive 4.3 miles to intersection with NC Hwy 66. Turn left and drive 4.3 miles to Flat Shoals Road which branches off to the right. Take Flat Shoals Road – parking for the PYO field is the first driveway on the right – across the road from the farmhouse. Posted 5/16/2011 8:11am by Cheryl & Ray. 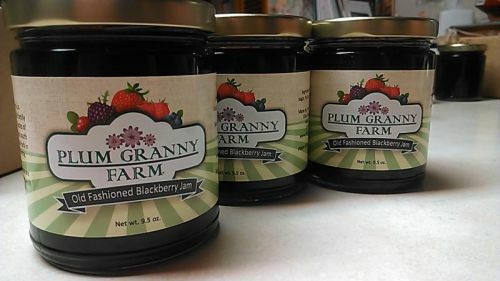 Things are really hopping around Plum Granny Farm! Plants are getting in the ground, weeds are growing...well, like weeds, and the garlic is beginning to form scapes! Never a dull moment here! Last week we had some very interesting visitors -- a swarm of bees (maybe even two) decided that our empty hives in the garage would be a great place to live. It started with several hundred checking out the place on Monday and then on Tuesday an entire swarm moved in! What an amazing sight! At nightfall, we moved the hive in with our others at the orchard. On Wednesday, another group of bees decided that the other empty hive might be a great place to set up shop -- so now we have two new hives joining our two. Wow -- what an honor to be adopted by bees -- an honor for a beekeeper, anyway! Posted 4/25/2011 7:35pm by Cheryl Ferguson. Just wanted to let our great customers know that we will be absent at markets until May 3. We are making the final transition of our New Mexico lives to a NC one! Believe me, we'd rather be at market than packing up our house!!!! See you all very soon! 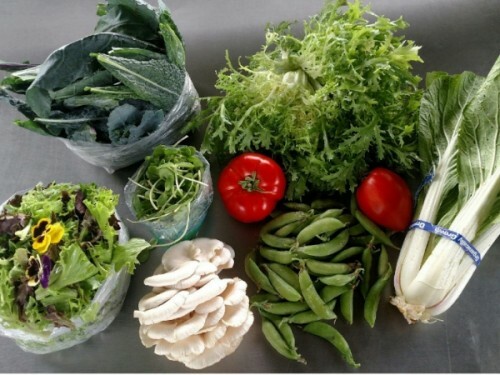 And start getting your tastebuds primed for some new products (salad mix and more) as well as old favorites. Won't be long until our spring raspberries start to come in!! Also, check out the recipe section for the recipe for out yummy Roasted Spring Garlic!! This was a hit at the Reynolda Village Farmers Market! Posted 4/9/2011 2:26pm by Cheryl & Ray. While many in this part of the world spent their winter dreaming of their days of glory playing the hoops in the ACC Tournament or the NCAA Final Four, we here at Plum Granny Farm had a few hoop dreams of our own. Now that all the hoopla is behind us (sorry about that George Mason! ), we wanted to share a few photos of how we turned our dreams of The Big Dance into reality! Some teams work with just one goal in mind. Not us! 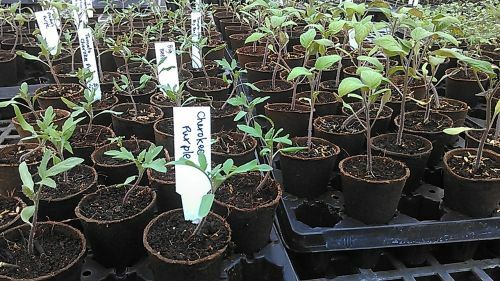 Nope, Team Plum Granny toiled over the winter to bring not just one but TWO greenhouses into being this year! And we are happy to say that we did it! We constructed an unheated high tunnel (or hoophouse) for season extension for a few of our raspberries (thanks to the NRCS Organic EQIP funding – our hats are off in thanks to our awesome agent, Dede DeBruhl!) Our other construction project was a conventional heated greenhouse which we are using for plant starts and ginger production. Take a look and see what you think! Blue sky but cold steel! Getting all the details right on the greenhouse before it is covered. A happy man and his plants! Posted 1/9/2011 8:26pm by Ray. I checked on the bees today. We rarely open hives in the winter, but I was worried about their food stores, and the 10-day weather forecast is for cold and breezy, with a few days of rain/sleet/snow. So feed them today or wait a couple of weeks. The Pink Ladies are doing O.K. I always check them first because they’re so encouraging - a neat & clean hive with straight comb and a healthy population. That gets my visits going on a good note. Today was no exception. Bars 10 and up were empty but I found bees between 8 and 9, along with a bit of capped honey. A quick peek between 7 and 8 indicated a good population, so I left some crystallized honey to help them out and closed the hive back up from the cold. The Artists and the White Room are O.K. as well. They both had me worried when I first opened the hives - - quite a few dead bees on the floor and roach-like bugs roaming some comb. But I found good populations between bars 7 and 8, and they still have capped honey. And although the White Room’s population seemed smaller, it was still lively enough that one bee flew up to my face and challenged me, so they’re O.K. Both colonies have always been a bit messy. Especially the Artists. But the Green House died. I don’t know why. A couple hundred dead bees on the floor. Honey and nectar in some comb. A tiny bit of capped brood - - just a small ring on two combs. And a hundred or so dead bees clustered between combs 5 and 6. It looks like they lost their queen and the population shrank until the last 100 froze one night in a huddle. Maybe she absconded. Maybe she died. I don’t know. I’ll look through the hive more closely tomorrow in the comfort of my shop. For now I’m too cold and a bit saddened. I put the hive on the tailgate of my truck and drove it back to the farmhouse. Driving slowly so the hive wouldn’t fall off, and still wearing my black veil, I felt like a mini funeral procession. Winter is hard on us all. Posted 1/8/2011 7:35pm by Cheryl Ferguson. Amazing. I’m standing in the kitchen cutting open a beautiful Long Island Cheese Pumpkin. I’m finally ready to turn this beauty into a stuffed pumpkin for a cold winter’s night. This pumpkin is almost a friend. It was given to me by one of the farmers who sells at the King Farmers Market as I was gathering items for our market’s booth at the County Fair. After the fair (in September), the pumpkin has been gracing our farm as a bit of a stately decoration -- but I have always known that its destiny was for a wonderful dinner. Well, that day has finally come. So I heft a large knife to ready it for stuffing with rice and lentils. As I scoop out the seeds, I notice there are sprouts among the seeds. Then, upon further inspection, there are not only sprouts, there are leaves! So as the winds are howling outside the window and the temperature plummets, it is comforting to see that the herald of spring comes within a humble (and tasty) pumpkin! Here’s to enjoying winter -- which is a bit easier when you see such harbingers of spring! Posted 12/26/2010 9:45am by Ray. The house is clean and decorated, with food for a party of 50. It’s time for our annual Christmas Open House! We hosted it once many years ago for Cheryl’s parents and all their friends and relatives around here, and those folks looked forward to it so much that we’ve just kept it up every year since. But right now there’s 5” of snow on the ground & some more on the way with 15-20 MPH winds. The roads aren’t bad, but they sure aren’t going to get any better. So in deference to all those older folks who would have to miss it, we’re postponing the party to Valentine’s Day. Time for music and raspberry cider and cookies by the fire, and a walk in the snow and a hot bowl of posole and a fresh tomato sandwich. When life hands you wintry weather ... make snow cream! Posted 10/25/2010 3:25pm by Cheryl & Ray.